I don’t think I’ve even seen those different sesame seeds here in Japan! I have waited for a new post for a while but it was well worth it. This looks and sounds so intriguing and up my alley… I wish I could taste it right now! You are truly an inspiration! These look amazing! Will try as soon as I get some sake in. I can’t believe a store actually sells wasabi and plum sesame seeds! How perfect for this cupcake! It does sound like a wild combination! But one thing I learned about white chocolate is that it’s an excellent vehicle for unusual flavors. 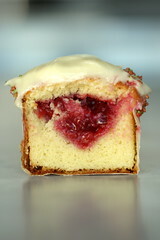 Yum, Philly-white chocolate frosting, and sake-plum filling?! Still can’t get my head around the wasabi element, but it sounds and looks delicious! Mmmm… looks great, sounds interesting. I’ll probably end up making these sometime since I’m so curious about the flavors. Wow! What an awesome combo! The look amazing! Question: where/when would you put in the wasabi paste? Would you maybe suggest going with the powder instead? fixed… and powder is fine, i just happened to buy paste. these look wonderful! i wanna try these out and see if i can use it for my current cuisine final (we’re doing contemporary asian) as one of the desserts. if i wanted to add more wasabi to get a stronger flavor, how would the ratios of the other ingredients need to be fixed? Not sure how I’d feel about a cupcake that could clear my sinuses, but it certainly looks tasty. Have tried plum crumble with fresh black plums.. Will have to give the cup cakes a go. Just need to know where you get those simple cool cups. I just wanted to post the fact that I split my time between Point Arena, CA, and SF, and Surf Super is my ‘local’grocery store! They actually have a lot of cool stuff for their location. Let me know if you’re going up north again- I have tips! As soon as I saw this on Tastespotting, I thought of Top Chef! Nicely done! I would love to try them. And great addition with the plum sake filling! Well… I never would have dreamed you could put wasabi in a cupcake… The small town folk here might be offended if I replaced their chocolate and vanilla. haha :) I’ll definately try these if I can find the ingredients. Question… I’m wanting to order some of those neat cupcake liners you have but I’m not sure how many ounces are in regular cupcake liner and mini cupcake liner… you wouldn’t happen to know would you? 3.25 ounce for regular and 1.25 ounce for mini. ooh, i love the color of the filling. Who is your photographer? He or she does a GREAT job!! What a wildly fabulous combination of flavors! I am impressed beyond words on this one. Everything about it is fabulous! Bravo!!! It does sound strangely good. The decoration is so perfect — what a lovely color combination. Oh my god, that’s just so perfect! 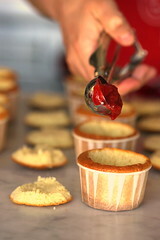 I’ve been trying to look for a good plum cupcake recipe to use for my mother’s birthday. I think I’ll practice making that immediately. Just found your site recently and have been eating it up! I love the look of these cupcakes, I’ve been trying to think of a way to combine white chocolate and wasabi ever since I saw that combo in Top Chef! Oh MY YUMMY! My mouth literally started watering reading this. Can’t wait to try it! Wow! Looks unreal…Thanks for posting! Your recipe sounds great… I imagine that the finished product tastes better than the White Chocolate Wasabi “Top Chef” cupcakes recently made by a bakery in Chicago… I tried them and they were kind of intense. Here’s the review! Amazing! I just added you to my favorites… wished you lived next door! I’m just tickled that you found them at the Surf Super. I take it you took a holiday at Sea Ranch? These cupcakes intrigue me greatly, and I really dislike white chocolate. But I think somthing pungent like wasabe and tart like plum should do the trick to cut through the bland sweetness of the stuff. Cheers! I am a visual artist who bakes, mainly cupcakes. A little while ago I started the project “Bake, Eat, Paint” a Sensory and color exploration to build a “Cupcake Paintings” series. Since I found your blog very interesting, I marked it as one of my favorites, among other ones. This recipe I found so exotic I had to bake it…and create a painting. 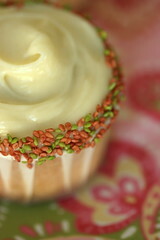 To the frosting I added wasabi powder(which I love! ), so it came a bit greenish. I put some dark chocolate chips for decoration, since that’s what I had at the moment. But they were mouth watering! I am enclosing the link for you to see all my cupcake paintings, including yours.